First you need a PINES library card. . .
Bring in a picture ID with your current address. If your ID or driver's license has an old address, then also bring in an official document (a piece of mail, lease agreement, bank statement, or check) with your correct name and address. Lost your card? Two dollars and clearing up any fines and fees on your account will get you a new card. We'll need to see your ID and current address, too. Children under 16 need a parent or guardian present to get a card and can not get a card if the parent or guardian has an outstanding balance. Already have a PINES card from another library? You can check out from and return materials to any PINES library in Georgia. Watch this on-line tutorial to learn how to navigate your library account. Here's a quick YouTube tutorial on how to access your PINES account online including placing holds, making book lists, renewing books, and much more. Please note: DVDs and CDs can be put on hold only within each local system. 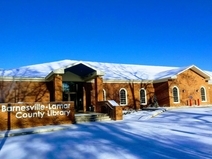 Barnesville-Lamar County library is part of the Flint River Regional Library System. Explore these links and discover some good reads and fun surprises. "Novelist"Georgia's Virtual Library, NoveList, helps you find fiction and nonfiction books and audio books by title, plot, keyword or author. Novelist Plus also includes "best of" lists, author "read-alikes," and book discussion guides great for teachers and book clubs. Novelist is available through GALILEO. "Fantastic Fiction" helps you find what books come next in a series and what books an author has written. Skip the advertising boxes and links at the top. Just type in the author or title for which you are searching. Find out more about your favorite authors, and see what books and authors they recommend. "The New York Times Best Seller List" is compiled from surveys of booksellers across the nation. Once a new book is released, it may take a few weeks for it to reach our library. If we do not get the book, there may be copies in the PINES system available for hold. Each library has the option to hold a book for its own patrons up to six months before releasing it for state-wide holds. "The Internet Archive" is building a digital library of internet sites and other cultural artifacts in digital form. It provides free access to researchers, historians, scholars, the print disabled, and the general public. It Includes video, live concerts, audio, texts, software, and TV news. Experience a 1970s Grateful Dead Concert, introduce Little Lulu to your grand kids, flip the pages of an illustrated medieval manuscript from their collection of over 6,000,000 books. There is even an Internet Archive Software Collection! Go exploring. It is totally free. And totally amazing. Recommended Reading List from How To Read A Book by Mortimer Adler: "On the following pages appears a list of books that it would be worth your while to read. We mean the phrase 'worth your while' quite seriously. Although not all of the books listed are "great" in any of the commonly accepted meanings of the term, all of them will reward you for the effort you make to read them. All of these books are over most people's heads--sufficiently so, at any rate, to force most readers to stretch their minds to understand and appreciate them. And that, of course, is the kind of book you should seek out if you want to improve your reading skills, and at the same time discover the best that has been thought and said in our literary tradition."